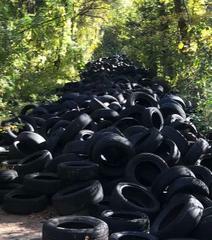 Man Who Dumped Over 100,000 Tires In Clayton County Now Placed #10 On SHERIFF VICTOR HILL’S Top Ten Most Wanted. 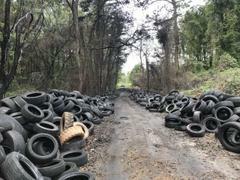 After finding over 100,000 tires dumped in different locations around the County, Clayton County Police Code Enforcement, Clayton County Department of Corrections, and D.N.R. joined forces to conduct an extensive investigation to find out who was responsible for the massive environmental pollution. 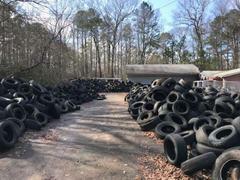 Code Enforcement Assistant Commander Lt. James Robinson, Clayton County Department Of Corrections Captain Boyd, and K. Godbee from the Department Of Natural Resources was able to identify Donald Deon Leverette as the perpetrator of the serial tire dumping after an extensive investigation. Two felony arrest warrants have been issued for Leverette’s arrest today. Investigators also discovered that Union City Officials had taken two misdemeanor warrants out for Leverette for illegal dumping that he has not yet been arrested for. Clayton County Sheriff Victor Hill has now ordered Leverette placed # 10 on his top ten most wanted and has tasked his elite Fugitive Squad to hunt him and bring his environmental destructive actions to a conclusion. The Sheriff has also made it clear that anyone in the tire business found having any further dealings with Leverette can expect to share a cell with him as well. 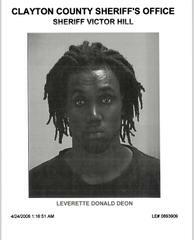 Leverette is describe as a black male with black hair, (dreadlocks) brown eyes, approximately 6ft5 weighing 215 pounds. Leverette is also known to carry a handgun and should be considered armed and dangerous. If Leverette is spotted please dial 911 immediately. If you have any information as to Leverette’s whereabouts, please contact the Fugitive Squad at 770-477-4479.